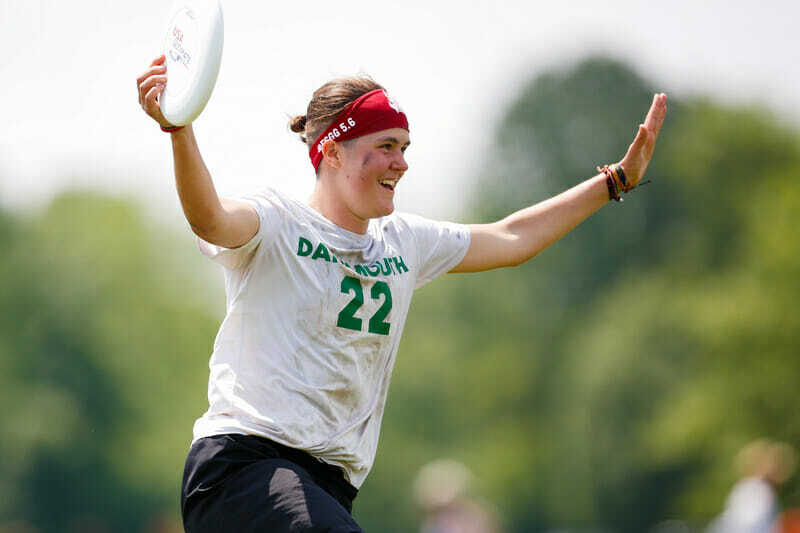 After leading Dartmouth Princess Layout to their first ever national championship, the accolades tacked on after Jaclyn Verzuh’s name are rivaling those of Khaleesi. Jaclyn Verzuh, Player of the Year. Jaclyn Verzuh, the best player in the college women’s division. The best player in college ultimate, period. The Greatest of All Time. We keep conjuring up ever more impressive superlatives that she turns into understatements in the next point. Verzuh walked into Nationals with the award already tentatively in her corner. After missing most of last season due to injury, her regular season dominance in 2017 was unmatched in either division. She helped Dartmouth march to Florida Winter Classic and Stanford Invite tournament titles without challenge. The division’s best defenders lined up to give her their best shot and she still made scoring, hucking, skying, breaking, and bidding look like a casual walk in the park. In Mason, OH, Verzuh had the most stacked stat line of the tournament — 33 goals, 24 assists, and 14 blocks — yet these numbers still undervalue her impact on the field. There are other women who can match her height in the deep space, but nobody else that tall has the agility and grace to catch the same disc eight feet in the air and eight inches off the ground, again and again. Her complete control of the downfield gave Dartmouth an offensive cheat code at Nationals. When teams set pressure on Dartmouth’s handlers, they could always rip the disc deep for Verzuh to stride down and grab. Defense was simply unfair. Verzuh’s ultimate IQ, her elite club experience with Riot, and her physical strength nullified opponents’ deep shot ambitions. It’s not confirmed that she even broke a sweat at Nationals. Like the Callahan award, the Player of the Year award tends to go to seniors who are peaking after a long career with their teams. Verzuh, however, is only a sophomore — and she may just be getting started. We all face the very real possibility that Jaclyn Verzuh could be the Player of the Year for several years to come. It’s time to start dreaming up new superlatives. Comments on "2017 Women’s College Player Of The Year, Presented By VC Ultimate & NUTC"